Join Us for another great Family Farm Day! We are thrilled to be hosting yet another brilliant Family Farm Day here at Robina's Organics, located at ALBA Organics. You can read all about the event on our Facebook Event Page! Family Farm Day - Art was alive on the farm! The 2016 Alba Family Farm Day was a great success! Meheen here, "the daughter." When I am not on the farm, I am either working on developing my art business, working on client projects, or doing research for an upcoming farm project! I was so happy to participate as an artist with Urban Arts Collaborative during Alba's Family Farm day! Together with local young artists, there was some live collaborative painting, face painting, artwork on display, and a full mural by JC Gonzales. It was a beautiful, warm sunny day and so wonderful to see community members, farmers and their families enjoying the bounty of organic farming while sharing their creativity! A long break since the last post. A lot has happened since. We harvested our summer crops - look for pictures in our updated photo gallery. In transitioning into fall, we had to plan around the schedule for my second year with ALBA’s Incubator Program. It begins November 1st and on a larger farm. This meant that in July and August we planted crops that would be ready for harvest by late October, before we move, across the dirt path to three-quarters or 1 acre farm. We transplanted Rainbow Chard July 1st, followed by direct seeding Butternut Squash and Zucchini a few days later. I experimented with row covers again. I covered Butternut Squash as soon as the seed germinated. This protected it from all kinds of bugs, particularly beetles. I did not cover the neighboring row of Zucchini that was direct seeded a few days after the Butternut. Do I regret it!! Almost immediately after germination, we saw an infestation of cucumber beetles, one I am not likely to forget any time soon. 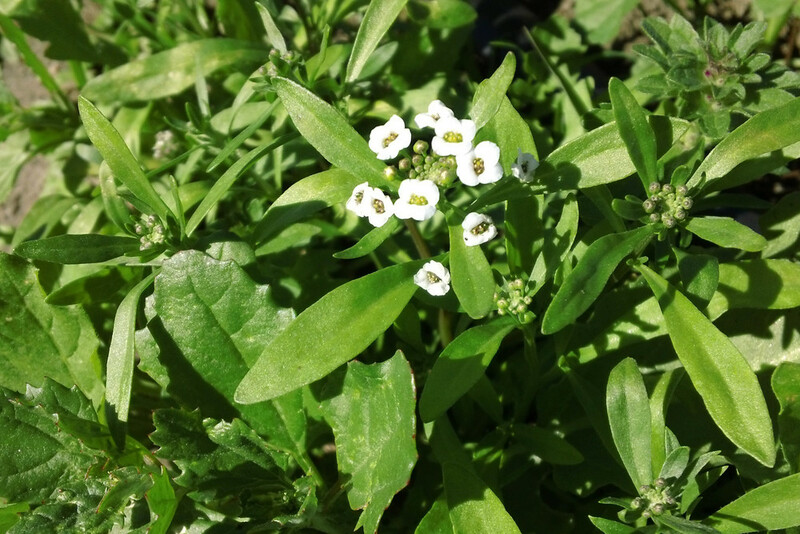 To control the damage these and other summer bugs caused, I inter-planted Radish, Bunching Onions, and flowers (Alyssum, Marigolds and Nasturtiums). These seemed to help the Butternut once, we removed the covers but my Zucchini plants took a while to recover. We did plant Yellow Summer Squash, Eight Ball Squash as well as a few Pumpkins and all of them are doing well. Among other crops were Spinach, Mizuna, Tatsoi, Cucumbers, Cilantro, Bunching Onions, Parsley and Radish. 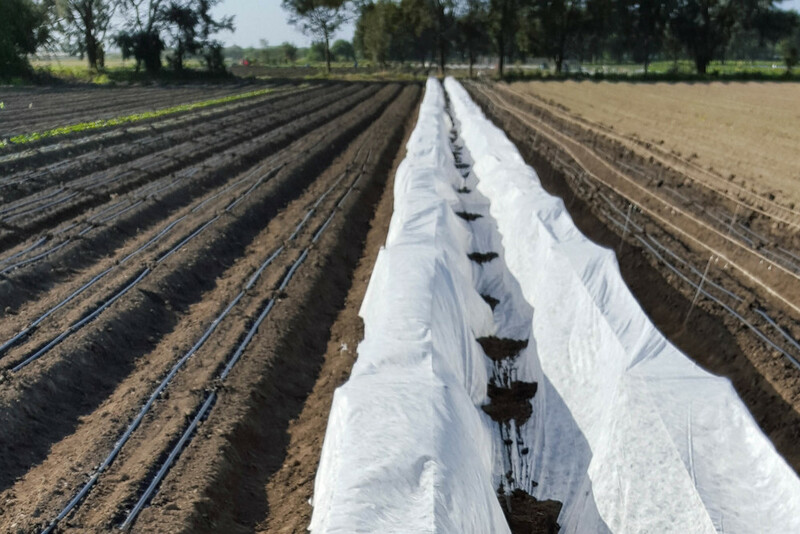 In late August we transplanted one row of Little Gem Lettuce and directed seeded another row. We also experimented, successfully, with Microgreens and are now ready to scale up on Microgreens. Another success was letting Spinach harden enough to bunch, even though we grew it under a row cover. Our summer and fall photo galleries capture our experiences, joys and challenges. We are looking forward to moving across the dirt path to a bigger property but still debating if we should stay under an acre or take on a full acre during the second year of the incubator program. We know what we want to grow, what has worked for us and what we need to avoid this next year. We love what we are learning and experiencing but our biggest challenge is time. It is time to update. A lot has happened since the last post. The semester was not quite over – the week of May 15th Evan had a serious accident. He was hospitalized for 3 days and is still recovering from his injury. It disrupted all the good work both of us had been putting into the farm. Once Evan was recovering at home, Abner and Meheen helped take care of him. This gave me enough time to return to farming. As I completed grading the following week, one of my Global Studies students came out with her daughter to help weed our rows of carrots. My friend Judy and her granddaughter joined us May 25th for a kid’s day at the farm. We have some lovely pictures.. Later that day, we disked our rows of greens (spinach, mustard, fenugreek and Asian greens) to prepare for a new crop. Look for the before and after pictures in our photo gallery. Broccoli transplants (4770) arrived May 26 and I spent a whole day planting Broccoli starts, laying drip tape and watering. I have maintained a photo record of our Broccoli but I am not the only one keeping a close watch. Aphids and Gophers have welcomed our new crop too. Keeping up with weeding is a tough task. Taking care of Evan and preparing for Abner’s graduation June 11th did not leave much time to weed. Early June we focused on Beets. We did manage to weed Beets (with a lot of help), and harvest the earliest of three rows. June 3rd we picked, washed and packaged 13 x 25lb bags!! 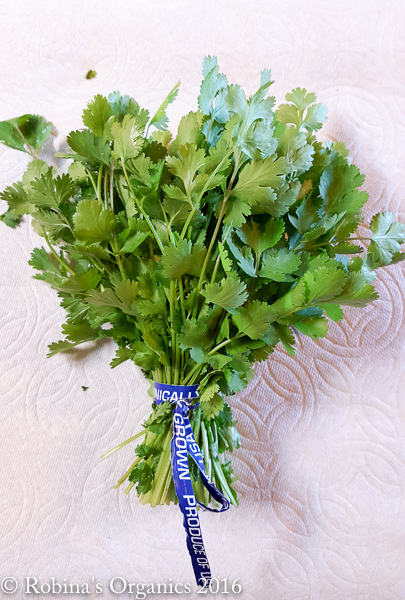 I harvested some cilantro but most of it was harvested by a farmer/neighbor. I let some of the cilantro flower and not only are we enjoying the fragrance, beneficial insects have been flocking to our fields. June 11th was graduation day. We had a wonderful time at Abner’s graduation ceremony and the party that followed. I saved farm greens and other vegetables for a creamy green curry (spinach, mustard, fenugreek, beet greens, cilantro and chives) for Abner’s party. I also made a Beet salad with Beets from the farm as well as a Fava bean salad (grown in our backyard). We had Pakistani food from one of our favorite restaurants in Hayward. 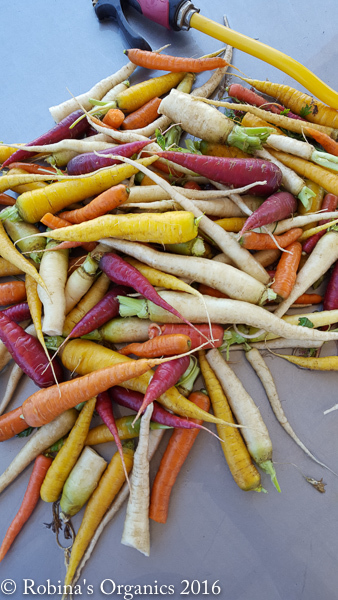 Abner, Meheen and I began harvesting Rainbow carrots June 15th. The first day we picked, washed and packaged 9 x 25lb bags. We finished harvesting last week and our final count was 33 bags total!!! Now on to harvesting the last two rows of Beets. Will keep you posted! Saturday April 23rd was an ultra-busy day. 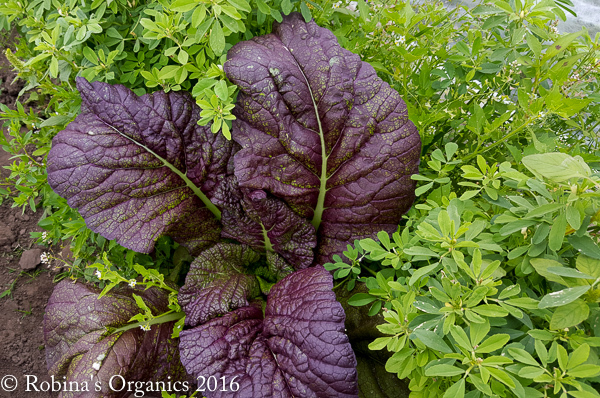 Evan, Meheen and I spent most of the day harvesting and packing Lettuce Mix, Komatsuna, Pac Choi, Red Mustard, Spinach and Tatsoi. ALBA Organics had pre-sold the 12 boxes we prepared. It brings us great joy to be part of a local, quality, ecologically-grown and green supply chain in our community. While all our Komatsuna, Mizuna, Pac Choi, and Tatsoi is sold, we still have plenty of Fenugreek, Spinach and Red Mustard, of interest to our local South Asian community. These are past the baby stage and almost at full maturity. We are now busy weeding Beets, Rainbow Carrots, Cilantro, and keeping a close watch on our mini Broccoli (Happy Rich variety) Collards, Garlic Chives, Bunching Onions and Sunflowers. Most of these should be ready mid to late May. Stay posted and do contact us for details. Harvesting and marketing our first crops! The quantities were small but the joy of harvesting and selling for the very first time was huge! 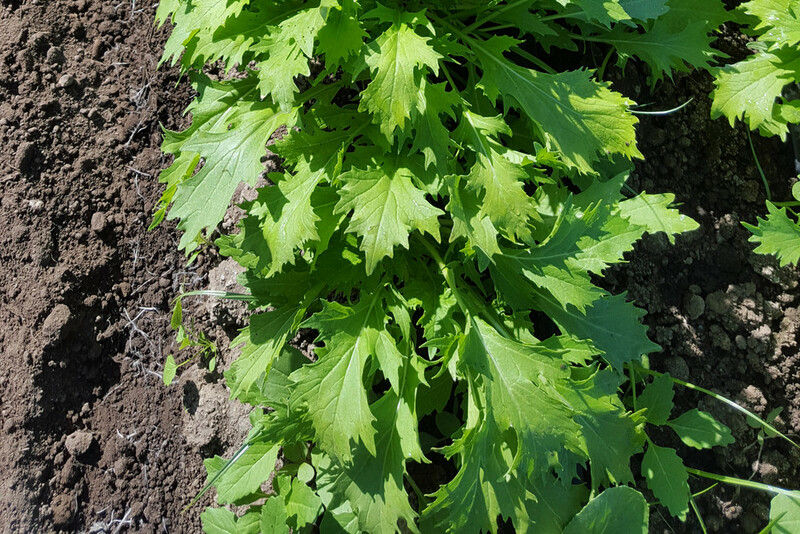 We harvested Mizuna, Pac Choi and Lettuce Mix for our first sale to local customer on Saturday April 16th. 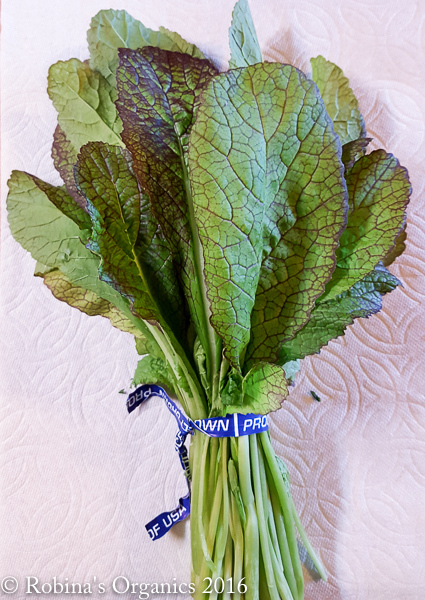 This weekend, April 22 and 23, we will be at our farm harvesting Baby Spinach, Red Giant Mustard, Fenugreek, Pac Choi, Tatsoi, Komatsuna, and Encore Lettuce Mix for ALBA Organics. Our Little Gem Lettuce is ready. If you happen to be at Youth Arts Collective show in Monterey on Saturday April 23rd, enjoy our Little Gem Lettuce Platter. From College to Farm, the first crop. 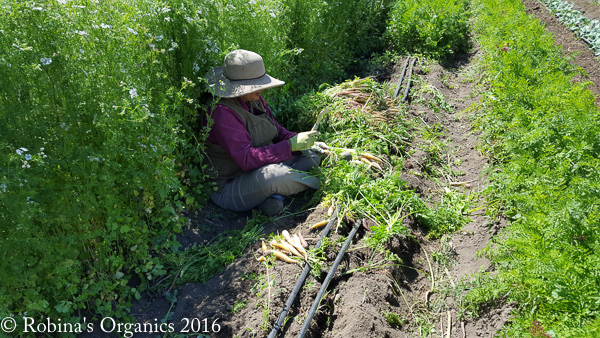 From cover crop to first sprouts to our first harvest, this is the inaugural year for Robina's Organics! 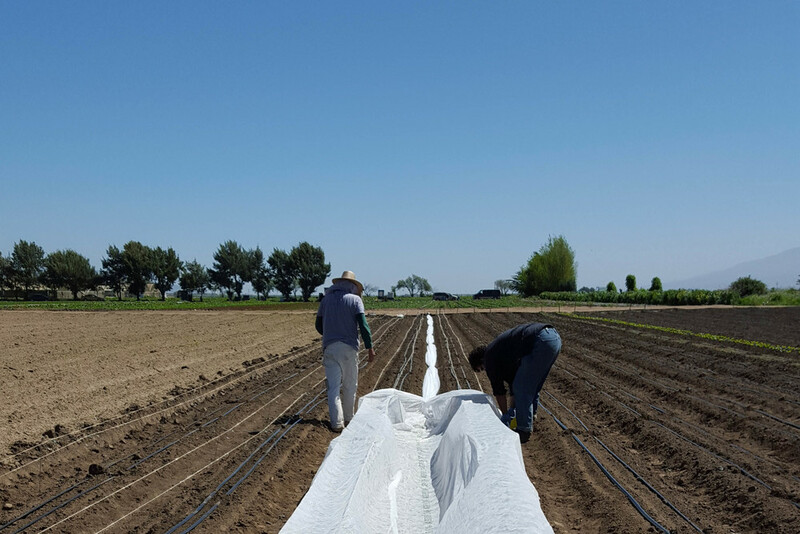 Below are some photos of our process, from the initial cover crop, plowing the first rows, installing drip tape irrigation, shading the rows, and our first alyssum, pac choi, mizuna, and our encore salad mix! We are very proud of our first crop! Here is where our founder Robina shares her thoughts, updates, and knowledge.